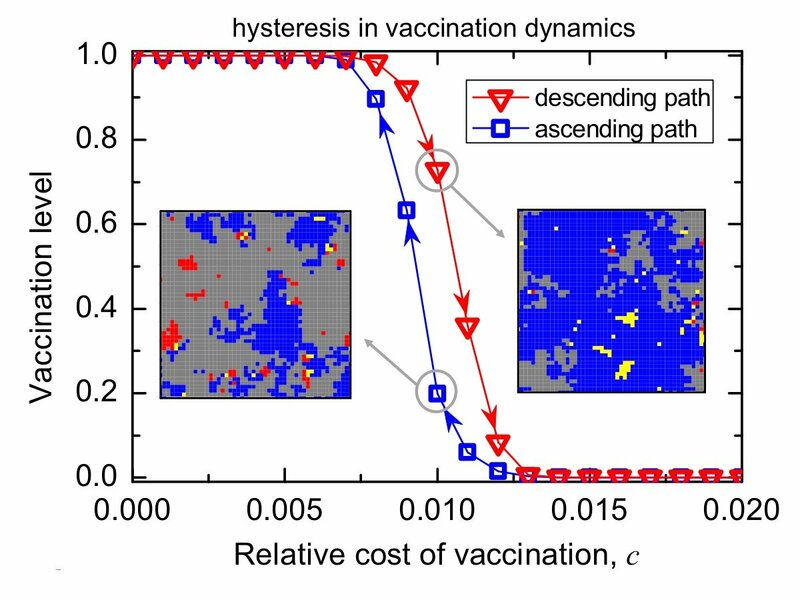 Social imitation dynamics of vaccination can exhibit hysteresis. This figure illustrates a hysteresis loop in relation to outbreaks of measles and other childhood diseases in Europe and North America. Credit: Feng Fu and Xingru Chen. A new study from Dartmouth College shows that past problems with vaccines can cause a phenomenon known as hysteresis, creating a negative history that stiffens public resolve against vaccination. The finding explains why it is so hard to increase uptake even when overwhelming evidence indicates that vaccines are safe and beneficial. A hysteresis loop causes the impact of a force to be observed even after the force itself has been eliminated. It’s why unemployment rates can sometimes remain high in a recovering economy. It’s why physical objects resist returning to their original state after being acted on by an outside force. And, according to the Dartmouth research, it’s why the public resists vaccination campaigns for ailments like the common flu. The research, published in the journal Proceedings of the Royal Society B, is the first study to demonstrate that hysteresis can impact public health. “Once people question the safety or effectiveness of a vaccine, it can be very difficult to get them to move beyond those negative associations. Hysteresis is a powerful force that is difficult to break at a societal level,” said Fu, who led the research team. Low vaccine compliance is a public health issue that can cause the loss of “herd immunity” and lead to the spread of infectious diseases. In parts of Europe and North America, childhood diseases like measles, mumps and pertussis have returned as a result of insufficient vaccination coverage. Previous studies have combined behavior models with epidemiology to understand the challenge of voluntary vaccination, but have been unable to completely explain the persistence of low vaccine compliance. The Dartmouth research specifically studies how past problems associated with vaccinations can impact present and future vaccination decisions. According to the research, the hysteresis loop can be caused by questions related to the risk and effectiveness of vaccines. Negative experiences or perceptions related to vaccination impact the trend of uptake over time—known to the researchers as a “vaccination trajectory” that gets stuck in the hysteresis loop. Hysteresis prevents an increase in vaccination levels even after the negative objections have been cleared, making society increasingly vulnerable to disease outbreaks. “When it comes to vaccination levels, the past predicts the future. Unfortunately, this means that a lot of people are going to needlessly suffer unless we find a way to break the negative impact of the hysteresis loop,” said Fu. The study refers to the example of whole-cell pertussis vaccine in England and Wales in the period from 1978 through 1992. It took that 15-year span for uptake of the “whooping cough” vaccine to recover from 30 percent to 91 percent. According to the research team, such a recovery should only take about a year under ideal circumstances. The research also notes the slow increase in measles vaccination in the face of resurgent outbreaks. In some countries, like France, measles has become an endemic disease despite the availability of an effective vaccine. “Vaccination levels in a population can drop quickly, but, because of hysteresis, the recovery in that same population can take many years,” said Chen. For the common flu, the study suggests that a vaccine would have to have an effectiveness of above 50 percent in order to achieve high levels of vaccination, a difficult level to reach because of the speed with which the illness mutates. By identifying the hysteresis effect in vaccination, the research team hopes that public health officials can design campaigns that increase voluntary vaccination rates, particularly by promoting vaccination as an altruistic behavior that is desired by moral and social norms.